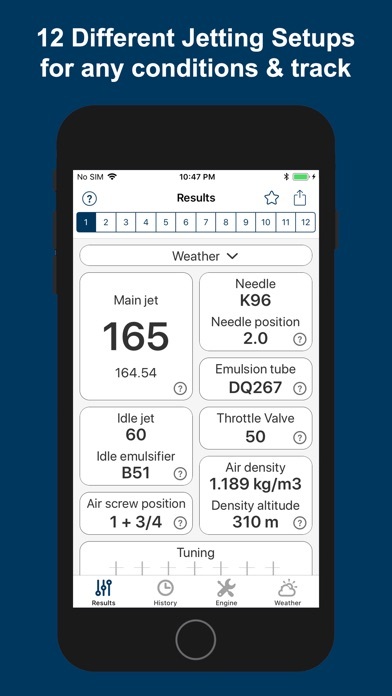 This app provides for the current weather conditions and a given engine configuration (engine model, floats, carb bore, emulsion tube type, floats, oil ratio, fuel type), 12 !!!!! 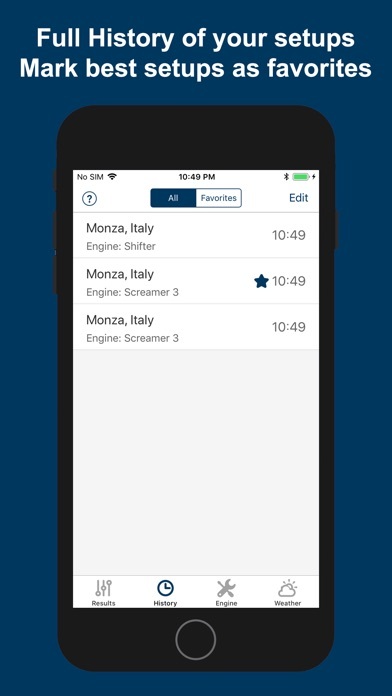 jetting recommendations for IAME (Parilla) Screamer 1, Screamer 2, Screamer 3, Shifter, X30 engines that have DellOrto VHSH 30 carbs. 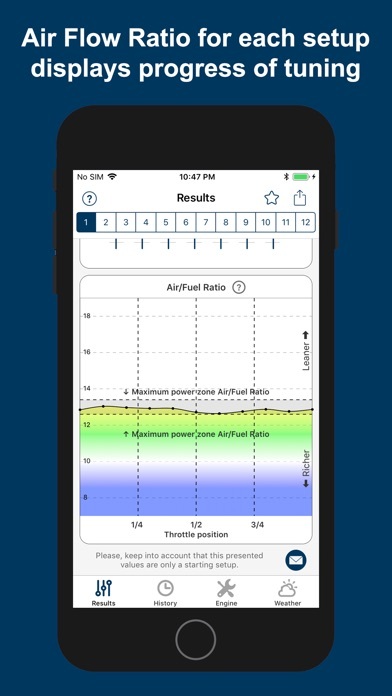 • let you use different measure units: ºC, ºF for temperatures, meter and feet for altitude, liters, ml, gallons, oz for fuel, and mb, hPa, mmHg, inHg atm for pressures. • Results: In this tab, 12 different jetting setups are shown. 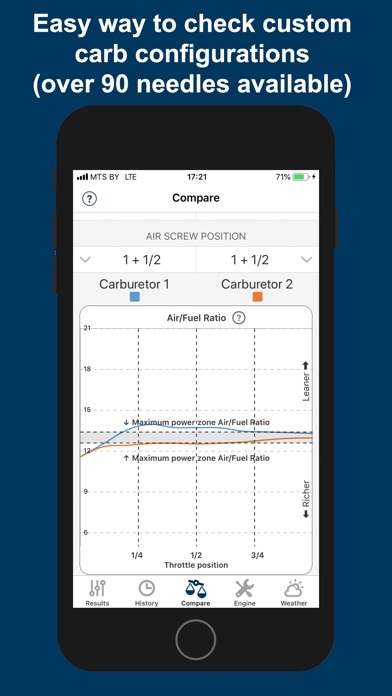 These data are calculated depending on the weather conditions and the engine and track configuration given in the next tabs. For each jetting setup, the following values are given: main jet, emulsion tube, needle type and needle position, idle emulsifier and idle jet, throttle valve, air screw position. 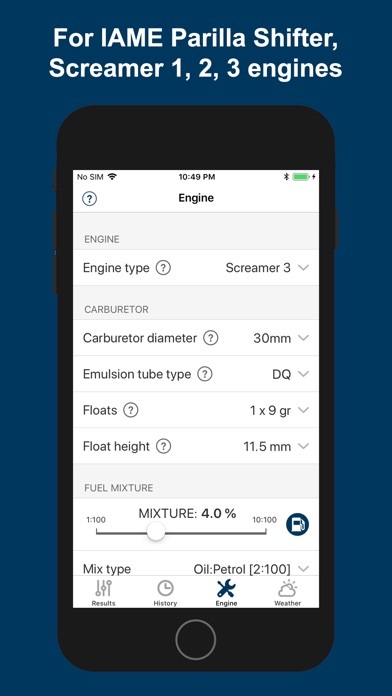 • Engine: You can configure in this screen the information about the engine, that is, engine model, carburetor diameter, emulsion tube type, float type and height, fuel type, oil mix ratio and type of the circuit. 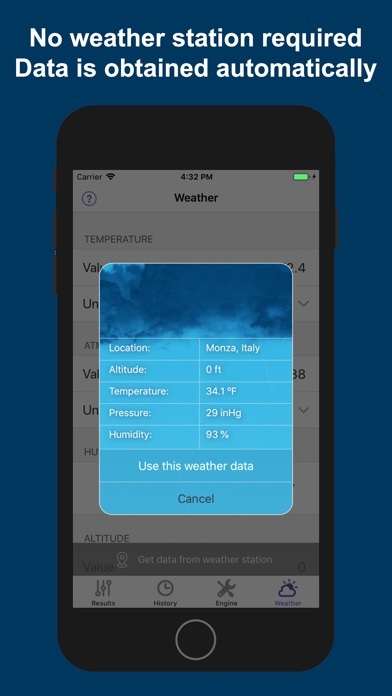 Also this tab allows to use the GPS to get the current position and altitude, and connect to an external services to get the weather conditions of the nearest weather station (temperature, pressure and humidity). In addition, this application can work with a pressure sensor built into the iPhone. 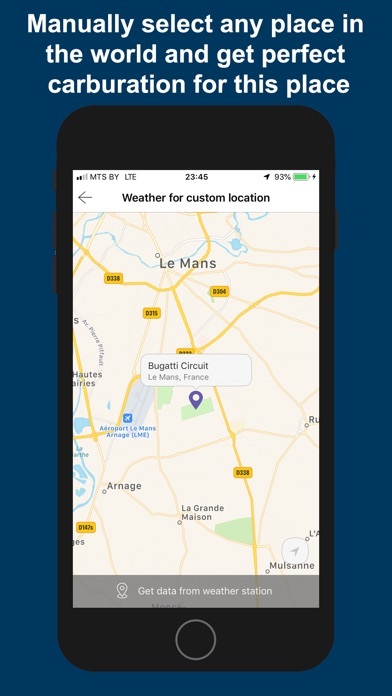 If you have any doubt about using this App, please, contact us. We answer every question, and we take care of all comments from our users to try to improve our software.